Norwegian Joy, Norwegian Cruise Line’s first custom-designed ship for the Chinese cruise market, began her journey to her home port of Shanghai, China this week, as she departed the MEYER WERFT shipyard in Papenburg, Germany on Sunday, March 26 for her approximately 14-hour long conveyance along the Ems River. Norwegian Joy’s river conveyance marks another key milestone in the ship’s highly anticipated delivery. Measuring 1,094 feet long and 136 feet wide, the ship is the second in the line’s Breakaway-Plus class and the first that was purpose-built for China. The 168,800–gross-ton Norwegian Joy departed MEYER WERFT at approximately 9:00 pm local time, making a narrow passage in reverse through the shipyard’s locks, passing the structure with just 1.2 meters separating the ship from the “bumpers” installed along the locks. The ship’s navigation team, led by experienced yard captains and River Ems pilots, included several navigation officers in charge of overseeing the bow maneuvers and others overseeing the movement of the stern. Several local authorities and other partners were also involved in supporting this precise maneuver. After passing through the sea lock in Papenburg, Norwegian Joy continued along the river, stern first. Due to the strong propulsion in the aft section of the vessel, traveling stern first helps with maneuverability, which is a key component when navigating the vessel through such narrow passages. 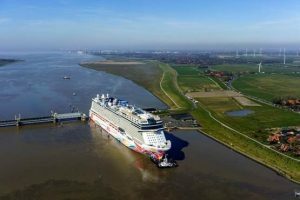 Before reaching her final destination in Eemshaven, Netherlands on Monday evening, March 27, Norwegian Joy passed through additional narrow passages including a railway Bridge in Weener; Jann-Berghaus Bridge in Leer and Ems-Barrier in Gandersum. Upon arrival in the Dutch port of Eemshaven, Norwegian Joy will take on additional provisions and further crew members, before heading toward the North Sea for sea trials later this month. Following her delivery on April 27, Norwegian Joy sets sail for China, where she will be showcased through a grand inaugural port tour featuring one-day events at the ports of Qingdao, Shenzhen, and Hong Kong, as well as VIP partner cruises from Norwegian Joy’s home-ports of Shanghai and Tianjin. This unique showcase tour will give travel agents and valued partners across the region the special opportunity to experience all that Norwegian Joy has to offer leading up to the ship’s christening ceremony on June 27, led by her Godfather, ‘King of Chinese Pop’, Wang Leehom. The spectacular inaugural celebration in Shanghai will include an exclusive concert and overnight cruise for honored guests.